The Bush tax cuts, and plugging corporate tax loopholes, are on the table in the world of reality, if not the world of politics. It has been said that there are many ways to skin a cat — not that I’d be willing to try any of them. Likewise, there might be many serious ways to balance the federal budget — not that enough people in Washington are willing to try any of them. And some have closed the door on the only real way to do it: with balance. Even the House speaker says all options must be on the table, except revenues. This, despite the fact that lost revenues holds a greater share of our building debt than any other single cause. This Center on Budget and Policy Priorities graph illustrates shares of the current and future deficits, by cause. Note the orange bar — Bush-era tax cuts. 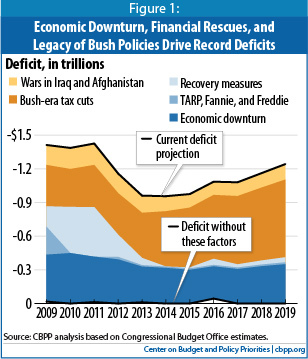 The President and Congress could make major progress toward stabilizing the debt for the coming decade by letting all of the Bush tax cuts expire on schedule at the end of 2012. The fact is, we cannot afford not to use a balanced approach to the deficit and debt challenges facing the United States now and in the future. The Bush tax cuts, and plugging corporate tax loopholes, are on the table in the world of reality, if not the world of politics. It is impossible to avoid their relationship to the debt, even if, somehow, people are finding it possible to ignore them.